Chrysi Avgi demonstration in Komotini, Greece. Anti-Semitism, violence and belief in an “absolute and genuine” nationalist revolution are central to the Greek extreme right-wing party Golden Dawn. HSI looks at its past and speaks with Greek investigative journalist Dimitris Psarras. In a recent article, the political scientist Antonis A. Ellinas of the University of Cyprus states that the “late-democratized Southern European countries were thought to resist the rise of far-right parties observed elsewhere” in Europe. Thus, the electoral breakthrough of Golden Dawn (Chrysi Avgi in Greek, or CA) in Greece’s 2012 elections “took many by surprise”. The party – which received merely 0.29 per cent of the vote in the 2009 elections, or less than 20,000 votes – rose to almost 7 per cent in the May 2012 elections. Many expected voters would desert the party in the June elections, but the party secured 6.92 per cent. Subsequent polls have shown the party reaching 11-12 per cent. It does, however, reject the National Socialist or Nazi label often used to describe it, even while party documents make little secret of an ideological lineage from interwar fascism. One of the few in-depth studies of Chrysi Avgi is the book The Black Bible of the Golden Dawn (Η μαύρη βίβλος της Χρυσής Αυγής), a book which – according to its publisher, Polis – is soon to be published in English and French. HSI has spoken to its author, the investigative journalist Dimitris Psarras. “Chrysi Avgi first appeared as a magazine in December 1980. Its ideology was strictly German national socialism, and the articles in the magazine were all inspired by Hitler, Goebbels, Rosenberg, et cetera. At first, the organization was kind of an ‘inner circle’ of Nazis and had very few activities in the streets,” Psarras says. He describes the party leader, Nikolaos Michaloliakos, as a former pupil of Konstantinos Plevris, a notorious right-wing extremist, Holocaust denier and author of the strongly anti-Semitic book Jews: The Whole Truth. In the mid-1980s, however, Michaloliakos went on to form the Chrysi Avgi as a political organization. “It began the attacks against political opponents – leftists, anarchists, internationalists – and transformed to a political party, without giving up street violence,” Psarris notes. 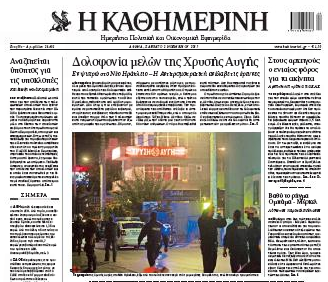 – In English-language media, Chrysi Avgi is occasionally described as a neo-Nazi party. Is this description accurate, perhaps outdated or an oversimplification? Where could one place Chrysi Avgi in relation to other extreme right-wing groups across Europe? – And yet it has been growing immensely in the last few years. Have they gone through a “moderation” process, making it more palatable for the Greek electorate? “No, there has been no such ‘moderation’. It is not easy to describe their increased success, but it is a combination of the growing social crisis in Greece, and the collapse of the Greek political system. People who vote for the CA are of course not all Nazis, but they seek a revenge against the ‘system’, and as a weapon for such a revenge they need an extremist organization. It is important to understand the state of urgency in Greece, with rates of unemployment over 30 per cent, and amongst younger people over 50 or even 60 per cent unemployment. The voters of the Chrysi Avgi are helpless, desperate people. “In addition, the mainstream parties have made many mistakes, helping the Chrysi Avgi to become a considerable political power. The first mistake was the three-party government of Loukas Papadimos at the end of 2011. PASOK and New Democracy accepted the far-right party LAOS as partners. The message given to the voters was that right-wing extremism can be a positive factor for national stability. LAOS voters, who were disappointed by the ‘mainstream turn’ of LAOS, turned towards Chrysi Avgi. The second mistake was the imitation of the anti-immigrant political agenda of the Chrysi Avgi by the two mainstream parties before the May 2012 elections. The real winner was the extremists, not the mainstream parties. – What is the relationship between the party and violence? “Violence is the main goal of the Chrysi Avgi. It is not merely a political means to achieve a goal, it is the end. Every night we see attacks against immigrants, and the victims always describe men with black shirts and the trademark of the Chrysi Avgi. Of course, they deny any relation. And when members of the party are caught red-handed, the party says that they are not members or that their involvement is a result of a plot from the police or from their political opponents. – In Western Europe, one could describe a shift in the ideology of the far right, away from outspoken anti-Semitism, towards a general opposition to immigrants, and increasingly with an anti-Muslim focus. Has there been a similar ideological development in Greece? Psarras points out that the Lebanese extremist group Hezbollah is hailed as an example to emulate. – With such open extremism, what can be said about the international connections of the Chrysi Avgi today? With the political and economic power the party has have gained as a result of the last elections, it is now trying to build a new international network.